Project Party A Neixiang Tailong Building Materials Co., Ltd. This 4500 t/d dry cement clinker production line is the largest project invested by Tailong Corporation. Its annual output value is 220 million CNY and 3.8 million profit and taxation after put into use. As the greatest privately owned dry clinker manufacture, in Henan Province, this project makes the corporation realized a great-leap-forward development. With capacity of 1,800,000 tons cement per year, it has been the second cement enterprise in Nanyang City. Adopting new vertical roller mill to grind raw material, compared with previous ball mills, the power consumption reduces by 40%, the noise reduces by 20dB or so, and the product quality also improves significantly. The equipment adopts advanced hydraulic gear wheel device, and adopts metering plunger pump with high measuring accuracy, high-precision flow speed control valve, contact graphite block sealing device and other domestic advanced technologies. It is easy to operate and its performance is reliable. Compared with equipment with the same specifications, the operation rate increases by 10%, yield by 5%-10%, heat rate reduces by 15%. Realizing the automation of cement production process, high efficiency, excellent quality, low energy consumption and environmental protection. 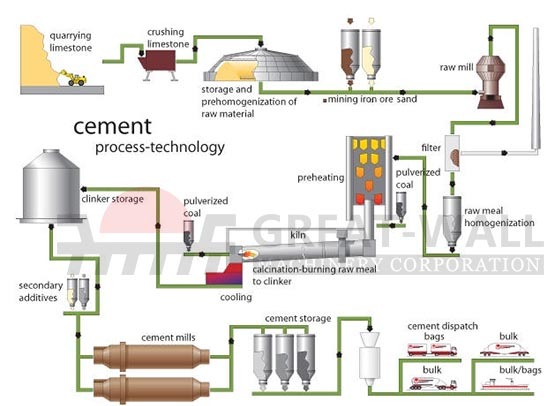 The cement production line adopts the latest and the most advanced dry process production technology, reducing the consumption of raw material on the whole and improving the output. Since the production line went into operation, the equipment runs stably, the output is high and the product quality is excellent, improving the production capacity of Nanyang Neixiang Tailong Building Materials Co., LTD significantly. With the output increasing, the initial costs have been recovered. Meanwhile, as the sales range expands constantly and the impact improves gradually, Nanyang Neixiang Tailong Building Materials Co., LTD steps into the forefront of cement industry.